One for the New MacBook? 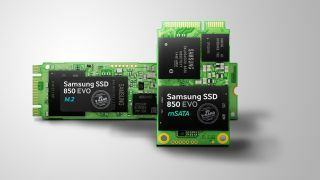 Samsung has introduced two new SSDs that could find their way into a new generation of super-slim Ultrabooks. The company's 2.5-inch 3-bit 850 Evo SSDs come in mSATA and M.2 SATA versions, meaning they can be squeezed into devices of a similar thickness to Apple's new MacBook. Based on Samsung's proprietary 3D V-NAND technology, they stack 32 layers of memory on top of one another to fit more memory into the same small area. This means that Samsung can create SSDs with more memory than you usually find in Ultrabooks. Available now in 120GB, 250GB, 500GB and 1TB capacities, Samsung's mSATA and SATA SSDs boast read speeds of up to 540Mbps and write speeds of up to 520Mbps. Both drives have TurboWrite technology that means the 500GB and 1TB capacity SSDs offer random write speeds of up to 88K IOPS and random read speeds of up to 97K IOPS. Its M.2 counterpart, meanwhile, is also SATA-based and comes in 500GB, 250GB and 120GB capacities while offering read speeds of up to 540Mbps and write speeds of up to 500Mbps.